A few years ago, expecting main stream consumers to spend a thousand dollars on a phone would have seemed unlikely. But the barrier is broken now. iPhone X, which helped Apple achieve its revenue super cycle in Q2 2018, has been surpassed by the new iPhone XS and XS Max, which have reset the pricing high-water mark. The more expensive iPhones represent an opportunity for other OEMs to launch their flagships at increased prices while still providing a high-value proposition at a lower price point than Apple. This is, at least partially, the reason we have seen 2018 flagship launches from key android OEMs like Samsung, Huawei, OPPO, Vivo, OnePlus at higher price than their previous flagships; there is also a material cost in, for example, increased memory. Smartphones are central to people’s lives. For many, their smartphone is the last thing they look at before sleeping and the first thing they look at on waking. And during the day, it is rarely more than an arm’s length away. A smartphone is also a personal statement that expresses the user’s personality in the same way that some people do with clothes or their car. Considering the role a phone plays, perhaps paying more than 1000 USD doesn’t seem so much. The quality of devices themselves is also improving. The new iPhone models are IP68 compliant – the highest rating for water and dust resistance. iPhone 7 (and up to iPhone X) was ‘only’ IP67 compliant and earlier iPhones had no water or dust resistance. As moisture damage is the second most common reason for reducing the value of a product after broken displays, this is important. It means products are better able to withstand the rigors of everyday life, last longer and sustain their value. 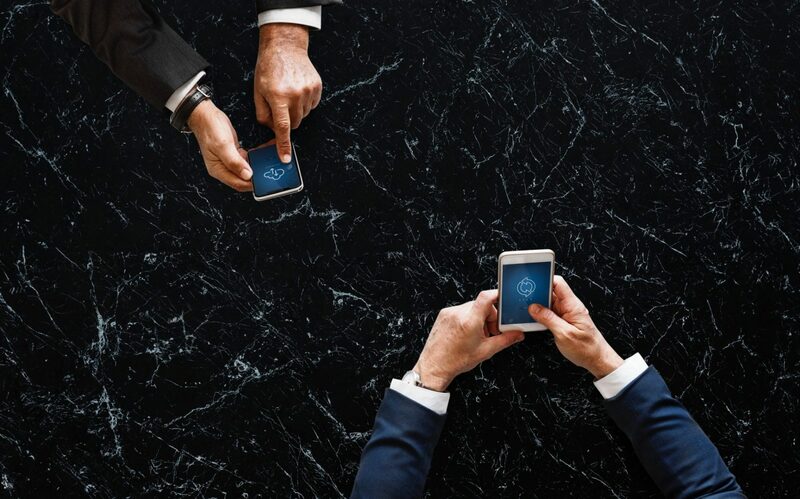 These factors are helping consumers to hold on to their phones for longer periods, lengthening the upgrade cycle and thereby causing overall market growth to slow or even contract. OEMs are keen to maintain or even increase the replacement rate. They are therefore promoting trade ins, upgrade programs (Apple Upgrade), EMI and other incentives. If successful, they can sell more, new devices and are able to extract further value from the used handset. And the residual value is important for both the industry and the consumer. As we have seen in our refurbished handset studies, the value of a high-grade second-hand phone (especially iPhone) is considerable. Consumers can buy and use a 1000 USD iPhone for a year and then sell it back to the trade for 60 to 70 percent of its original cost. The real cost of ownership therefore, is less than original ticket price suggests. The increasing prices of devices across the globe is visible from the surge in regional ASPs. The trend will likely continue. Depending on the market, the ASP increase can happen within different price bands. Premium flagships from OEMs and the introduction of 5G phones in 2019 will drive the ASPs in mature markets like North America, Japan, Korea and Western Europe. 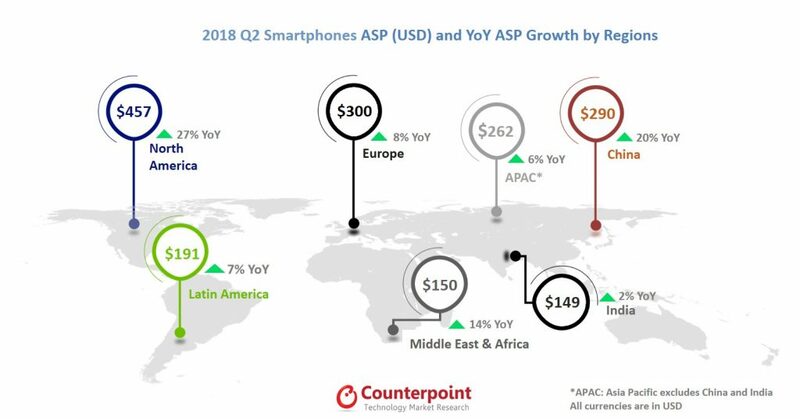 The increasing ASPs of devices in the affordable premium segment like OnePlus, older iPhone models and models with higher ASPs from brands including, Oppo, Vivo, Xiaomi and Huawei, will drive the ASP in emerging markets like India. *Source: Counterpoint Market Monitor Report Q2 2018. The diffusion of high-end features to mid-range products means the focus for OEMs shifts from hardware features to softer factors such as design, colors, materials and finish, and brand cachet. The ultra-premium segment is small, and Apple dominates it thanks to its strong brand built on its carefully developed and rigorously managed ecosystem. Other OEMs are also expanding ASPs, taking advantage of the headroom created by Apple. But few have the brand power necessary to sustain a position in the $1000 plus segment. 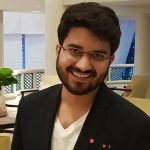 Varun is a Research Analyst at Counterpoint Research based out of Gurgaon. In Counterpoint, he closely tracks mobile devices and ecosystem with a focus on Emerging Markets. He also tracks Global Refurbished Smartphone market. He started his career as a Consultant with Infosys Limited where he was able to identify strategic avenues for business growth through deep research and analysis of markets and companies in various domains. He holds a Master of Business Administration in Marketing from Institute of Management Technology, Ghaziabad and a bachelors degree from Coventry University, UK.